Smart Surfaces are “non-destructive” which means they are not permanent and you can switch looks or remove them at any time and your original artwork will remain untouched! These are the ten most common Smart Surface settings you will find in most GrutBrushes Art Surfaces. When you open the Art Surface PSD it will probably be set to Basic by default. To switch to any other look, just select the checkbox next to the you Smart Surface you want to apply and you will instantly see the effects applied to your artwork. TIP: Personally, I recommend using the "Subtle" setting. I think it is the most realistic and useful of all the presets. The texture is less prominent and that keeps the focus on the artwork itself. You will usually find that either the Basic, Coated or Subtle setting will do in most cases. To check your art without any Art Surface texture at any time just select None. These will be unaffected by the Art Surface texture and will sit on top of it. This is also great for painting like the Old Masters did. 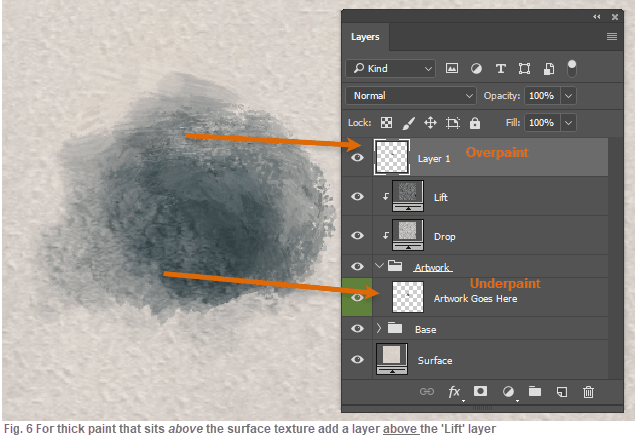 Paint your thin underpainting in the green Artwork layer and your overpainting in a new layer above them all. Keep some of the green underpainting layer visible underneath amidst the overpainting, for an ultra realistic look. 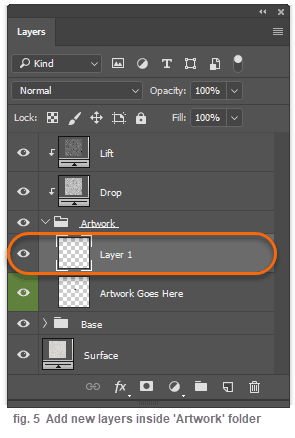 Unfortunately, when you switch Layer Comps to apply a different look, any new layers you added will become invisible. This is due to the way Photoshop Layer Comps work and there is currently no way to stop it. 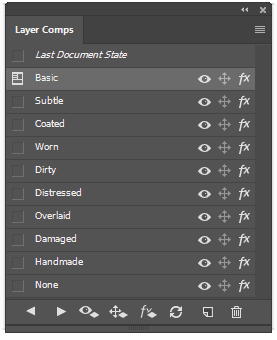 To see them again, click on the eye next to the layer name. GrutBrushes Art Surfaces are infinite, seamless canvasses, which means that it tiles seamlessly forever in all directions beyond all four edges of your canvas. To reveal more of this infinite canvas, just select the crop tool and drag outside the edges of your canvas and hit ‘Enter’ Once you do that the Art Surface will expand to fill in the new space where the checkerboard pattern is. Keep in mind that even a tiled surface will show a repeating pattern if you loop it too many times. The infinite canvas is really meant to free you from being locked to a fixed aspect ratio or running out of room at the edge of your image . You can easily switch from a landscape to a portrait format by dragging out one of the edges. 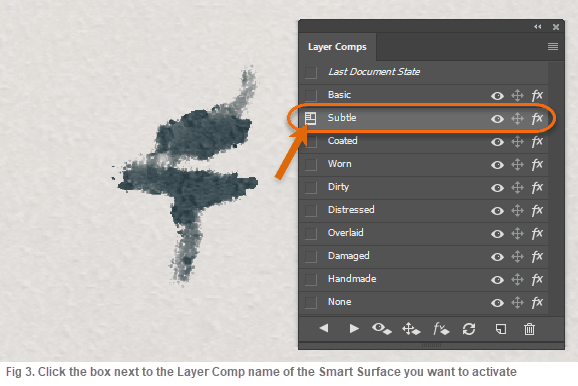 The larger you make your canvas, the more you are in effect ‘zooming out’ from your canvas and your surface texture will become less and less prominent, so try to crop inward if you can, to keep the textures visible. There’s no point in painting on a beautifully textured canvas if you are going to look at it from outer space. There are times when you may even want to zoom in to show even more texture in a close up painting. 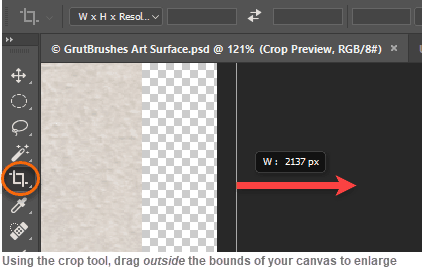 All GrutBrushes Art Surfaces are 300 dpi so even if you zoom in to 200% they will still be 150dpi. To do this, select Image > Image Size from the menu and select a width larger than the current size. Some Art Surfaces will be able to handle scaling better than others and how big you can go depends on how much sharpness you need. Ideally you would want to enlarge your Art Surface before you paint or your paint strokes will be scaled as well and that will defeat the whole purpose of scaling it. 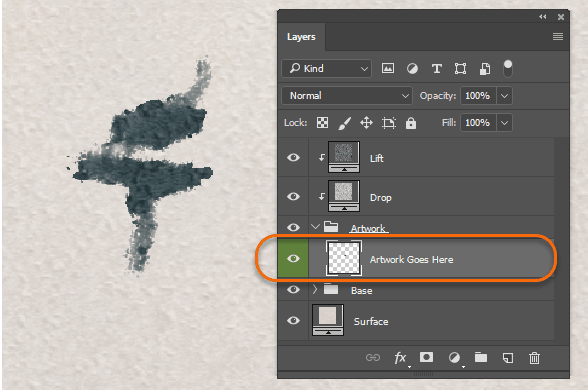 In the bottom left corner of every Art Surface is a little Photoshop note which can be opened by double-clicking on it. In it you will find some of the tips (like these) as well as the name of the Art Surface. This can be useful after you have saved your artwork with a different name and want to know which Art Surface you used. Feel free to hide move or even delete this note if you’d like. Basic: This is the default setting and shows the texture fairly prominently in both the background and on the paint layer. Subtle: Both the background and the paint layer textures are toned down and less defined. This allows the artwork to be more prominent. Coated: Subtler texture on the paint layer but strong surface texture below. This surface acts as if lightly coated in clay and is therefore less absorbent, so the texture on your paint will be subtler making it appear slightly more opaque. Worn: The raised texture of the surface has been worn down and some paint has rubbed off. Dirty: The recessed divots in the surface are darker where dirt has collected. Distressed: Wear and tear appears on the surface bumps as well as dirt in the crevices. Damaged: Extreme version of Distressed. None: Click this one to quickly remove both the background texture and the overlaid surface texture and lighting effects. Basically just your artwork on a white layer.